Samsung Galaxy Note 2 is coming to Verizon with model number SCH-I605. The device from Samsung will be first multi-carrier release of the Note. Opposed to past years when this model was released only on AT & T (in the U.S.), this year more companies it’s possible to get a version of this model SCH-I605, among these companies lists: AT & T, T-Mobile, NE cellular, Verizon, Sprint and Bell. 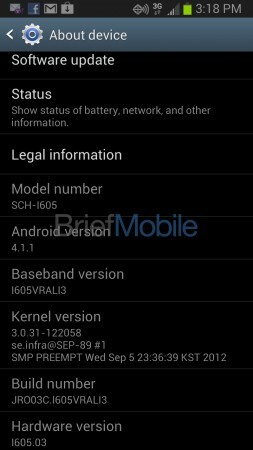 In the screenshot from Mobile Brief, clearly that would show a Samsung SCH-I605 listed device, this smartphone model SCH I605 will be Verizon’s model of the Galaxy Note II with a quad-core Exynos Processor and 4G LTE service. Anonymous source says, the Verizon Galaxy Notes II version, will be almost identical to the international version with addition brand Verizon, on the front and along the back of device.